Good morning. Today's newsletter is heavy on the theme of PRC influence and the growing concern from the West, particularly in the U.S.
Situational awareness: Between the North Korea crisis, the growing U.S.-China trade trade tensions, and the rising wariness about PRC activities in general, it sure feels like 2018 may be the most difficult year in U.S.-China relations in decades. Axios will help you understand China and the rest of the world. Axios turned 1 this week — and, more importantly, we're launching our newest coverage area: international affairs. Plus we're adding around-the-clock coverage of world events that includes outside experts like CFR president Richard Haass. See the new stream here. And, if you want to read me more than once a week, check out my daily Sinocism China Newsletter and follow me on Twitter @niubi. The Chinese Communist Party emphasized its expanding global ambitions in a remarkable 5,500 character treatise on the front page of Monday's "People's Daily." 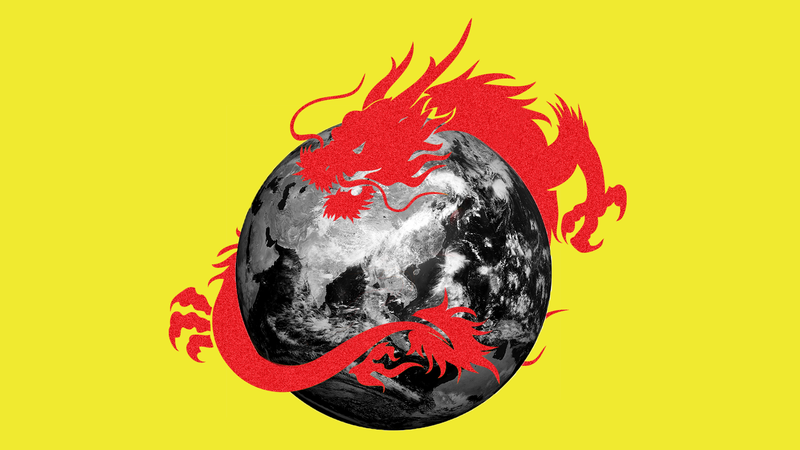 Why it matters: This is further evidence of the seriousness of China's broad global vision. President Xi Jinping sees a remarkable opportunity, enhanced by the Trump presidency and its “America First” policies, to reshape the global order in ways that legitimize the Chinese political system and create more strategic advantages for the China. Flashback: The Xi era and its growing global ambition was ushered in during the 19th Chinese Communist Party Congress last fall, where Xi vowed to increase China’s global influence and reshape global governance. Beijing’s crackdown on capital outflows and investments in non-strategic assets coupled with the increasing hostile environment in Western countries to PRC investment in a growing number of "sensitive" sectors caused China’s ODI to drop nearly 30% in 2017 to around $120 billion. "[D]ropped by more than a third (35%) in 2017 to $29 billion of consummated deals. In terms of new activity, the drop was even sharper – the value of newly announced Chinese acquisitions in the US dropped by 90% compared to previous year." "In terms of industries, the biggest losers were entertainment, consumer products and services and real estate and hospitality. Investment remained stable or grew in health and biotech, ICT and transport and infrastructure." "[P]rivate investors continued to account for about 90% of investment in the US." The bottom line: Do not expect these trends to change in 2018. Beijing has signaled it will not weaken its crackdown on capital flight and “irrational” overseas M&A, and the U.S. and other Western countries are only increasing their scrutiny of PRC deals. According to a Reuters report Friday, the U.S. government will no longer approve deals by Chinese behemoth HNA until it the firm provides more details about its shareholders. Why it matters: This move means that the acquisition of former White House press secretary Anthony Scaramucci's SkyBridge Capital, announced nearly a year ago, will remain on hold. Go deeper: As Axios' Dan Primack reported Thursday, the Senate is seriously considering expanding the scope of The Committee on Foreign Investment in the U.S., with a particular focus on expanding scrutiny of PRC investments. Not just HNA: Members of Congress are also reportedly pushing AT&T to cut ties to telecom equipment manufacturer Huawei. Huawei is a key player in developing the standards for 5G networks. More: A Friday Xinhua commentary says "The U.S. should get over its allergy to Chinese investment". Seven senators led by Marco Rubio (R-Fla.) and Patrick Leahy (D-Vt.) have sent a letter to the Department of Justice urging the DOJ to require PRC-controlled media operating in the U.S. to register as foreign agents under the Foreign Agent Registration Act (FARA). Similar to Russia’s state-controlled RT and Sputnik news services, the People’s Republic of China controls several media organizations that disseminate news and propaganda domestically and internationally....The Chinese Communist Party is clear in viewing media as a political tool—functioning as a ‘‘mouthpiece’’ for its official positions and in shaping public opinion. In February 2016, Chinese President and Communist Party General Secretary Xi Jinping reiterated the primacy of the Party’s control of the media in visits to Xinhua, People’s Daily, and China Central Television (CCTV). President Xi also stated that the media ‘‘must be surnamed Party’’ and called for ‘‘absolute loyalty’’ to the Party from official media outlets and personnel. The background: Russia's RT Network and Sputnik registered under FARA in November 2017. The senator's letter appears to be in response to this December 2017 article in Foreign Policy about CGTN America, an overseas arm of the Chinese Communist Party's CCTV broadcaster. China is on track to overtake the U.S. in expenditures on science research and development — if they haven’t already, Axios' Erin Ross reports. According to the National Science Foundation’s congressionally mandated Science & Engineering Indicators report released today, overall spending on research in China has gone up by roughly 18% each year since 2000. The annual increase in the U.S. is just 4%. Yes, but science is not a zero-sum game, notes chemist Geraldine Richmond, who authored the report that evaluates the state of science in the nation and the world every two years. Even if the U.S. falls behind in science leadership, they will collaborate with and build off of research done in other countries, she says. The big funding question: “Where do we want to lead, in science and technology, and where are we content to participate?” Richmond asked during the press conference. Chinese regulators have forced Marriott to agree to an eight point “rectification” plan to make amends for listing Taiwan, Tibet, Hong Kong and Macao as countries and for an employee “liking” a tweet by a group that supports Tibetan Independence. fired the U..S-based employee who liked the tweet. terminated its contract with the Canadian firm that created the survey listing Taiwan, Tibet, Hong Kong and Macao as countries. Why it matters: Marriott’s mess will be a case study for all foreign firms with business in China. Significantly, the PRC government has punished a U.S. firm for the activities of a U.S.-based employee on a U.S.-based social media platform that is blocked in China, and that U.S. firm acquiesced without a fight. Axios' Ina Fried writes that Baidu announced Thursday it made a trio of hires and is establishing two new AI labs — one focused on business intelligence and the other on robotics and autonomous driving. Why it matters: These are both hot research areas and represent Baidu's biggest moves in AI since Andrew Ng left last March. Former IBM, Microsoft and AT&T Labs researcher Kenneth Church, an influential research scientist in natural language processing. Big Data expert Jun Huan, formerly a computer science professor at the University of Kansas. Rutgers University professor Hui Xiong, whose research focuses on data engineering. “This is the beginning of a new journey for Baidu Research. Our mission will be centered on conducting future-looking fundamental research, setting the direction for Baidu’s future AI development and empowering the company’s long-term strategy,” Baidu research head Haifeng Wang said in a statement. To forestall a future crisis from a shrinking working population, China in 2015 relaxed its draconian family planning rules to allow most couples to have two children. 17.23 million babies were born in 2017, declining from 17.86 million in 2016, according to data released by China’s National Bureau of Statistics on Thursday. China’s working age population in 2017, aged 16 to 59, totaled 902 million, or 64.8% of the total population, 5 million fewer in that age bracket than last year. People older than 65 totaled 158 million by the end of 2017, accounting for 11.4% of the population, and 8 million more than in 2016. Why it matters: The decades-long one child policy will lead to a shortage of workers to support economic development and fund the retirement of hundred of millions. One of the many reasons China is pushing so hard on upgrading its manufacturing technology and developing artificial intelligence is the hope that those can help offset the damage from the demographic deficit. New York Times: Wang-Li Moser, a key executive in Facebook’s efforts to enter China, resigned in December. MacroPolo: Google China 2.0 and the Ethics of AI Engagement . Bloomberg: China Uses Facial Recognition to Fence In Villagers in Far West. New York Times: Arrested Former C.I.A. Officer Had Ties to Chinese Spies, Ex-Colleague Says. Axios: How the CIA network in China collapsed. Mercator Institute for China Studies: China fights for Iran deal to fulfill its own geo-economic interests. SupChina: Caught In A Crossfire: Chinese Students Abroad And The Battle For Their Hearts. China Heritage: White Paper, Red Menace, in which the dean of Australian sinology Geremie R. Barmé argues that “Xi Jinping’s party-state is the legitimate heir of Mao’s China”. Sixth Tone: The Eagle-Eyed Vigilantes Defending the Chinese Language. LA Review of Books: Badlands of Xinjiang, a photo essay from China’s far west.